David Lloyd won the Main Event of the Grosvenor UK Poker Tour in Brighton after a tremendous slice of good fortune in the heads-up against Piers Whyman. Indeed, it had been David Lloyd´s day ever since the fourteen players took their seats for the climax of the GukPT Brighton Main Event, as he had started the day in thirteenth place with only 106,000 chips (blinds 5,000/10,000 – ante 1,000) and some way behind overnight chip leader Nicholas Stylianou (836,000 chips). David Lloyd was all-in twice in the first ten minutes of play without getting called, but he was third time lucky when Rajinder Kumar (Q-J) called his shove with A-Q enabling Lloyd to climb up to 240,000 chips. Lloyd then hit a quiet spell while the five of the fourteen players departed, and he entered the final table seventh of the nine remaining players. Piers Whyman was the most active in the early final table exchanges – losing a Sevens -v- Aces race to double up Gary Sandford, and then doubling back up when his pocket Kings made Quads to crack Nik Stylianou´s pocket Aces. Despite Sandford´s early double, he was the first player to leave the final table when his A-J failed to improve against Dan Bushell´s pocket Kings; and Perry Fox was soon to join him on the rail after a three-way pot which saw Danny Tran (A-A) cripple Nik Stylianou (Q-Q) and eliminate Fox (A-6). Reduced to less than one big blind, Nik Stylianou was bust in the next hand (seventh), while Danny Tran increased the size of his stack to more than 1.75 million chips and held a commanding chip lead over Piers Whyman and the Bushell brothers. As Level 22 started (blinds 10,000/20,000 – ante 2,500), David Lloyd (200,000 chips) was the shortest stack of the six remaining players after Graham Farbrace (A-7) had rivered a Seven to double up against Dan Bushell (A-9), but Lloyd´s good run was just about to start. In one of the first hands of Level 22, David Lloyd (A-A) once again got his chips into the middle and he was called by Piers Whyman (8-8). The flop of 3-3-7 was good for Lloyd, but the Eight on the turn looked like David Lloyd´s participation in the GukPT was about to come to an end – only for an Ace to be dealt on the river to give David Lloyd a better Full House. Lloyd (8-4) then called Graham Farbrace´s optimistic shove with 4-3 and held to bust Farbrace in sixth and – shortly after Matt Bushell was eliminated in fifth (AK > AA of Danny Tran) – Lloyd then got another double up when his pocket Tens held against Tran´s A-6. Lloyd moved to more than 1 million chips when his own A-6 was too good for Dan Bushell (K-10 – bust in fourth) and, as the game went three-handed, a deal was agreed between the equally-chipped players which would see each take £18,500 with the remaining £1,830 to play for. David Lloyd and Piers Whyman both contributed to Danny Tran´s demise in third. In one of the first hands of Level 24 (blinds 20,000/40,000 – ante 5,000), Tran bet 80,000 chips after the flop of 10-8-6. Piers Whyman called that bet, and Tran´s larger bet of 135,000 after an Ace was dealt on the Turn. Following another Eight on the River, Whyman lead the action with a bet of 290,000. Tran called, and turned over A-5 for top pair. However, Whyman showed K-8 for Trip Eights and his win in the pot reduced Tran to 350,000 chips. Tran (6-5) then shoved the last of his chips into the A-9 of David Lloyd and, failing to improve his hand, was eliminated in third. Piers Whyman took a narrow chip advantage into the heads up (2 million -v- 1.9 million), and he extended that lead with a series of uncontested pots against David Lloyd. However, Lloyd was about to enjoy his greatest slice of good luck when shoving A-8 into Whyman´s pocket Kings. 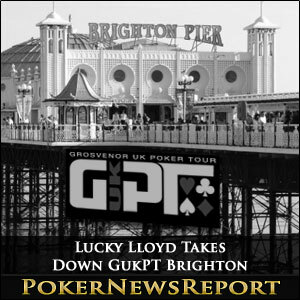 It again looked like the end of Lloyd´s tournament when the flop of Q-5-10 made Whyman an 87% favourite to win the GukPT Brighton Main Event, but an Eight on the Turn and an Eight on the River gave the massive pot – and 7:1 chip advantage – to David Lloyd. The final hand of the tournament was not long coming after that dramatic twist of fate. Piers Whyman moved all-in with K-5 and David Lloyd made the call. The flop of 7-A-K paired up both players, but the Turn and River failed to improve Whyman´s hand, and David Lloyd was GukPT Brighton Champion. The £550.00 buy-in Grosvenor UK Poker Tour Main Event in Brighton attracted 198 players and created a prize pool of £99,000 – with the top 20 enjoying a share of the money. After several deals at the final table, David Lloyd collected £ – a few grand less than the original first prize of £28,210, but after the good fortune he enjoyed at the final table he is unlikely to be complaining much!